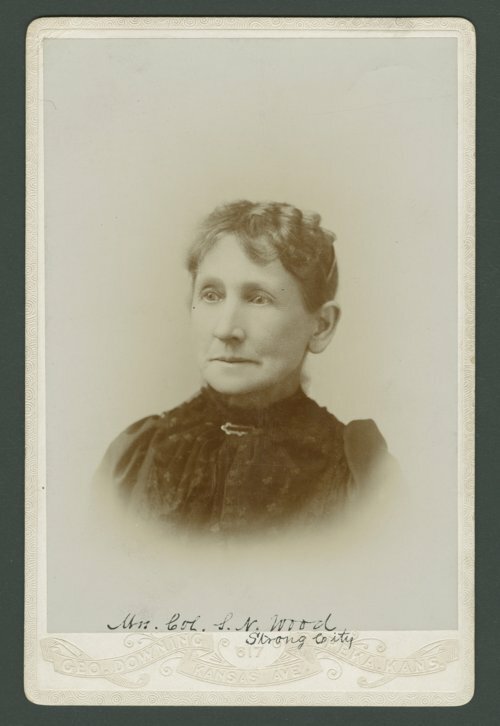 This cabinet card shows Margaret Walker Lyon Wood,1830-1919). The wife of newspaper publisher and politician Samuel Newitt Wood. The couple migrated in 1854 to the Kansas Territory as abolitionists and supporters of the free-state movement. For a brief period of time the couple resided in Lawrence, Kansas, from 1854 to 1859 before moving in 1859 to Cottonwood Falls, Kansas. Margaret lived a long and fulfilling life in the community until her passing at the age of eighty-nine. Burial was conducted at the Prairie Grove cemetery in Cottonwood Falls, Kansas.